Federal Prosecutors Told Not To Focus On Marijuana Users : The Two-Way Attorney General Eric Holder is instructing his prosecutors to concentrate instead on cartels, criminal enterprises and those who sell the drug to children. A customer rolls a joint made of half marijuana and half tobacco to smoke inside of Frankie Sports Bar and Grill in Olympia, Wash., in December 2012. 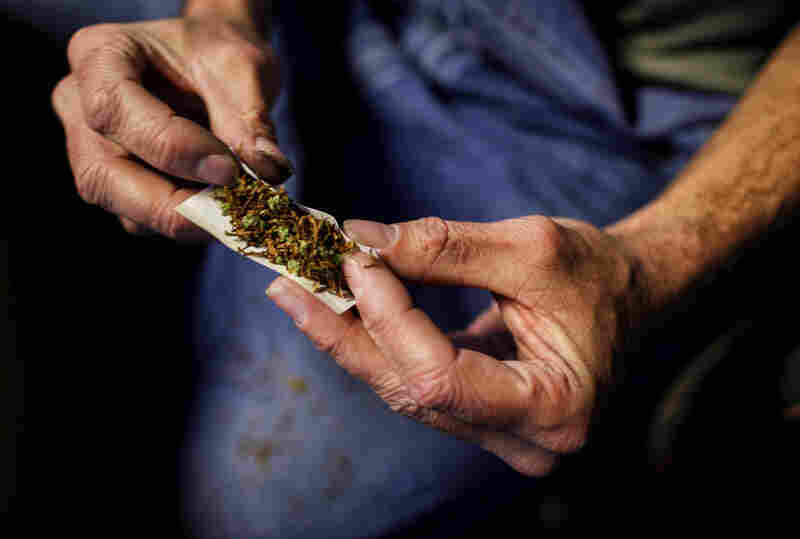 Federal prosecutors are being told by Attorney General Eric Holder to focus on cartels, criminal enterprises and those who sell the drug to children, not on casual marijuana users, a Justice Department official tells NPR's Carrie Johnson. Holder today informed the governors of Washington and Colorado — two states that recently legalized the sale of marijuana for personal use — about the new guidelines for prosecutors, the official adds. Bu the new guidelines will apply to all states, not just Washington, Colorado and those where "medical marijuana" is legal. "Based on assurances that those states will impose an appropriately strict regulatory system, the Department has informed the governors of both states that it is deferring its right to challenge their legalization laws at this time," Justice said in a statement. Thursday's news comes the same week that Senate Judiciary Committee Chairman Patrick Leahy, D-Vt., said he would call Holder to Capitol Hill to lay out how the Justice Department would handle marijuana offenses in states that have legalized small amounts of the drug. Earlier this month, Holder spelled out the Obama administration's objections to "draconian mandatory minimum sentences" for nonviolent offenders — many of whom would include drug users. Senate Judiciary Committee Chairman Patrick Leahy, D-Vt., says he welcomes the new guidelines issued by the Justice Department. "Our oversight on this issue was intended to provide movement on this policy question," Leahy said in a statement. "All the more in a time when federal resources are especially scarce, the Justice Department should focus on countering and prosecuting violent crime, while respecting the will of the states whose people have voted to legalize small amounts of marijuana for personal and medical use." The Justice Department has posted its memo to U.S. Attorneys (pdf). In it, the department lays out what it is concerned about. Among other things, it is prioritizing preventing the distribution of marijuana to minors, preventing the transfer of pot to states where it's not legal and preventing pot from being used as a "cover or pretext for the trafficking of other illegal drugs or other illegal activity."